INDIANAPOLIS, Ind. - The educational experience taking place daily in the Wabash College classroom is often described as amazing. When professors take their students outside the classroom, the experience often becomes one students never forget. Members of David Timmerman’s Classic Rhetoric class and Patrick Myers’ Ancient History Greek and Roman Law class took their lessons to Indianapolis’ federal court building Monday morning. The students participated in a mock trial, as it would have happened in ancient Greece. The witnesses to their presentation included not only classmates, but also three Wabash alums now practicing law in Indianapolis. The students quietly filed into the ornate federal courtroom of Sarah Evans Barker, an honorary degree holder from Wabash College. Three alumni watched the presentation and talked about the differences between ancient Greek courts and courts today. They also stayed afterwards to talk and interact with students. "I enjoy talking to the Wabash students," said Mark Rutherford ’82, who practices business law in Indianapolis. "They have lots of questions. We have high caliber students at Wabash and they ask great questions. I had alumni who were very helpful to me. I remember coming up after presentations and asking questions and, despite myself, they gave me good advice and some of it I took and I ended up doing okay." The students took full advantage of the opportunity keeping all three attorneys talking for nearly a half hour after the session ended. "The biggest advantage is the interaction with the alums," Timmerman said of the Indianapolis trip. "Students can look at them and say ‘this gentleman was a Wabash College student just like me and look what he’s doing now, look how much knowledge and experience he has.’ "
The combination of the experienced lawyers and jaw-dropping ornate courtroom had students buzzing. "The courtroom is totally awesome," said Matt Ripley ’06, who portrayed the defendant in the mock trial, "When you look around with the lights and everything it’s so amazing. You look out there and think, ‘wow this is what it would be like to be in a trial.’ It’s definitely a little bit nerve wracking at first but after you get into it, it became a lot of fun." The atmosphere may have prompted students to work harder than usual. "It really puts pressure on them to perform really well," Myers said. "I think a lot of people put in a lot more time in preparing than they might have ordinarily. It’s edifying to see this is where the things you learn in college; this is where they get applied. It just helps students make the connection between what they learned in school and how they’ll use it when they get out." Timmerman said the courtroom worked as he had hoped before the trip. "To be able to do it in this courtroom is astounding," he said. "You step in there and you feel like justice is being done just by standing in that courtroom. The practice of the law either in ancient Greece or today is a highly significant event for society. Society went to great lengths to construct a room like this. Our judicial system is a foundational element of our democracy." Now they see that. They see, ‘I’m part of a society that highly values the practice of the law.’ think they can get inspired by that." Terrance Tharpe ’00 is a Marion County Deputy Prosecutor who said participating is a way to reach back to the college, even though he is a recent graduate. "One of the ways younger alumni can give back quickly is their time," Tharpe said. "We may not be that established in our professions yet and may not be able to do so in a monetary fashion, but certainly giving back with our time is just as rewarding." John Dowd ’69, works in the U.S. Attorney’s Office, was the other alumni participant. After the mock trial, the students spent another hour looking at the legislative procedures as they applied to ancient Greek law. The trip was funded by the Know Indiana program, a grant from Lilly Endowment. Hewitt is Wabash College's Director of New Media/Web Editor. 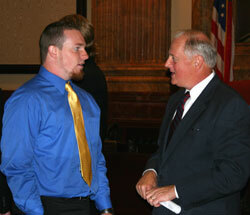 Top right: Rutherford talks with students after the presentation. 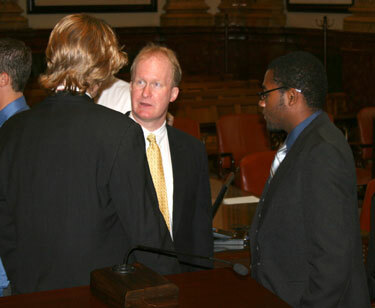 At left: Tharpe speaks to the students after the trial presentation. Bottom right: Dowd offers some advice after the class. 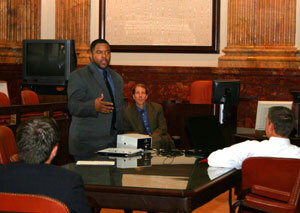 On homepage: The ornate federal courtroom was the backdrop for the classroom exercise.